Is it challenging for you to deliver a memorable in-store shopping experience? Are you unable to find the opportunity to reach the right person with right message at the right time? To avoid such scenarios and boost your customer in-store experience; you can make use of location-aware iBeacon technology. The latest devices of Apple have in-built iBeacon technology which provides location-based information and services through Bluetooth Low Energy (BLE) technology. What is iBeacon Technology and how does it work? iBeacon is an Apple’s micro-location technology that enables the mobile app to listen signals that is transmitted from beacons. It helps to determine the position of the user and accordingly deliver hyper-contextual content based on their location. With iBeacon technology, retailers can communicate and engage pro-actively with their customers not just when they are inside the store, but also when they are outside or around its premises. Since its introduction in 2013, it has brought about the paradigm shift in retail market by sending promotional messages and alerts to their potential customers in malls, restaurants, museums and various other places. iBeacon plays a very vital role in retail industry and has the power to bridge the gap between online and offline retail stores which can help the business to gain more sales and profits. For instance: Macy’s was one of the early adapters of iBeacon technology in order to enhancing and personalizing customer’s shopping experience. The technology is provides real-time information based on how customers interact with Macy’s online and brick-and-mortar store. It push notifies the users and provides discounts & promotions via Shopkick app based on in-store and online purchasing, browsing histories and current location. Serves as an advertising tool: Gone are the days when retailers were only relying on radio, TV, flyers, newspapers for advertisements to increase brand awareness. Today retailers can deliver personalized messages through iBeacon technology as it can trigger advertising messages to the user, based on the historical data and product reviews on the customer’s smart-phone. Additionally, it also enables the companies to send location-based promotions, coupons and offers as soon as user’s device comes within beacon’s proximity. With such benefit, brick and mortar store can increase their customer engagement by triggering the messages at right time and right place. Offers Personalization: Retailers can dig out customer’s data based on the past purchase history to suggest additional products / add-ons / complimentary gifts specific to each customer’s preferences. Retailers can send customized welcome messages to the users which can increase their willingness to shop more. Everything from coupons, deals and re-commendation can be customized based on the shopping habits of the customer. Moreover, iBeacon technology also senses how customers navigate inside the store in various departments, how long customer spends in their stores or on what days of the week they visit them and much more. Such additional insights can give them a better idea about customer behavior and also help in guiding them to look for the appropriate product. Just like Amazon provides personal shopping recommendations based on the previous purchases; iBeacon technology can do the same for brick and mortar store. Helps in re-targeting: With the help of proximity data provided by the beacons, retailers can re-target their customers. For instance: if the customer moved out of the store without buying anything, beacon device installed in that store will provide details to the store owner like what products did the customer look for, did the customer take trial? And with such data, store owner can push notify the customer with discount & offers on products they were interested in. Re-targeting enables the customers to return to your websites in some or the other ways and helps to re-connect with your brand which ultimately increases conversions. Small and medium size companies can most certainly make use of the iBeacon technology for understanding users’ behavior patterns. Enhances app engagement: With the increase in the use of smart phones and mobile shopping, beacons can bridge the gap between physical and digital retail space and can be considered as pivotal tool for shoppers. Due to the fact that beacons work via mobile app, it is the great opportunity for the brand to increase customer engagement and app retention. French multinational retailer Carrefour noticed 400% increases in mobile application engagement by implementing beacons. By leveraging iBeacon technology, app can prove to be a useful and engaging tool for shoppers. Ted Baker – British Luxury Clothing Retailer. Ted Baker looks to use mobile technology to communicate with its customers during their in-store shopping journey. Its Westfield White City shop in London has installed beacons in its mannequins and uses iBeacon technology that can detect customer’s smart-phone when they are in the proximity of beacons and triggers push-notifications to the customers. Shoppers can use the information to create look-books, share fashion inspiration with friends or access additional offers and promotions. Retailer has the option to assess customer information such as age, gender, location, and what outfits were viewed. iBeacon technology has the power to modernize the customer’s interaction for brick-and-mortar store owners. 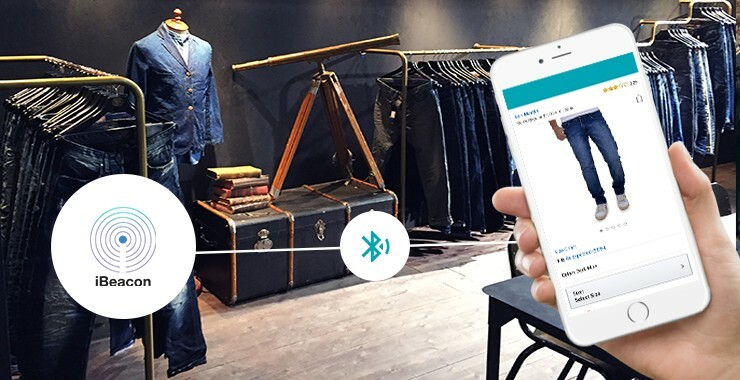 There is no doubt that beacons will have big influence on purchases, app engagement and retention, and customer experience. In layman’s terms, retailers who do not make use of this technology in the near future could see themselves lagging behind their competitors. So, are you looking to develop beacon-based mobile app? Let’s discuss.